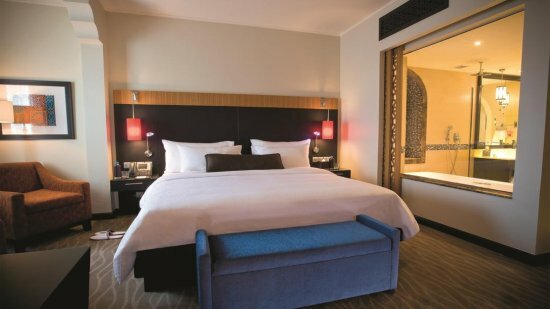 A unique 5-star retreat, the Movenpick Ibn Battuta Gate Hotel is one of Dubai’s leading resort choices for families and business travellers. Filled with unlimited luxuries, and boasting an array of services such as a rooftop swimming pool with stunning views of the city skyline, you’re sure to have a memorable Dubai holiday. Complimentary beach access to the Riva Beach Club on The Palm Jumeirah is another bonus. After days of being on the go it is time to unwind and let Safar Spa treatments provide therapy and restore wellness - the Little Birds Kids' Club will entertain the children whilst you relish a little free time. Relax in elaborate rooms and suites inspired by the ancient travels of the Arab explorer, Ibn Battuta. There’s three floors dedicated to guests travelling on business, and Executive Lounge privileges for those staying in Executive Rooms or Suites. With exclusive dining venues, and a fantastic central location, Movenpick has delivered in true style with the Ibn Battuta Gate Hotel. JBR Beach near Dubai marina is the closest, about 6km and an easy taxi ride away. Here you’ll find a family-friendly golden sandy beach with lots of water sports and even camel riding. 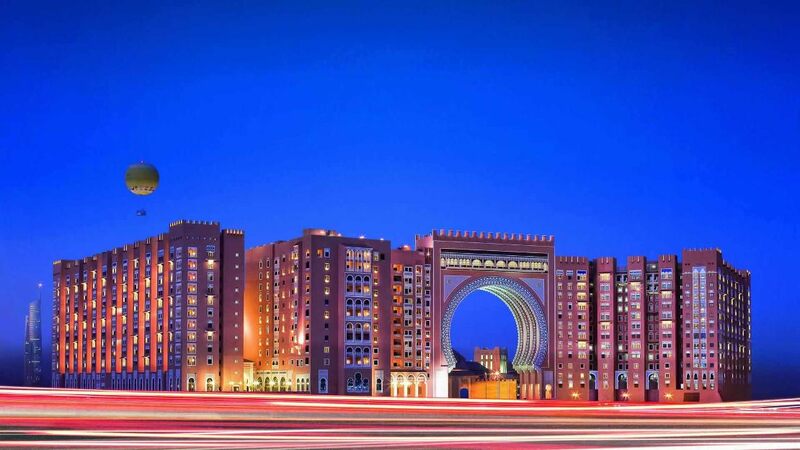 Movenpick Ibn Battuta Gate Hotel Dubai also offers entry to the Riva Club. Shopping, dining and entertainment are all on your doorstep when you stay at this hotel, with the themed Ibn Battuta Mall just a few minutes’ walk away. You can also easily take a taxi to stylish Dubai Marina and The Walk, for boutique shopping, cafes, restaurants and watersports, which is approximately 6km away. Family-fun is assured at Legoland, and the other Dubai Parks and Resorts, which are all within a 20-minute drive. To see the iconic Burj Khalifa, and nearby water fountain display in downtown Dubai it’s approximately a 27km journey. Emirates Golf Club is about 9km away. Dubai International Airport is approximately 40km from Movenpick Ibn Battuta Gate Hotel. Beautiful Arabian influences feature in the decor and furnishings of these Superior Rooms, which boast stunning city views. There's a choice of a king-size bed or twin beds. Revel in the space and privacy of two inter-connected rooms with a choice of a king-size bed or twin beds. Complimentary access to the Camel Kids' Club is included for all guests staying at Ibn Battuta Gate Hotel. 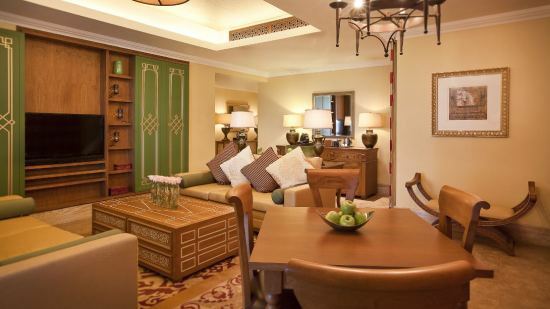 Rich Moroccan designs have been used to give these Deluxe rooms a lavish and relaxing feel. Accommodating up to 2 adults and 1 child, these rooms have extra space to settle into during your stay. 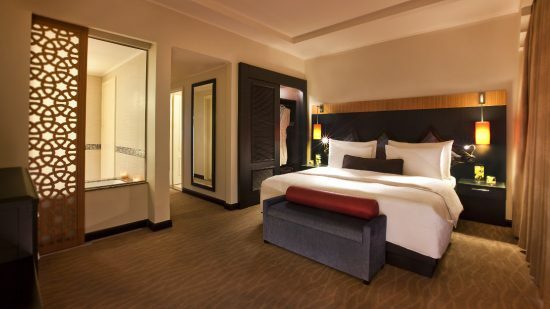 Situated on the Executive Floors, these luxurious rooms enjoy a host of complimentary privileges. Beautifully spacious, and enjoying the benefits of the Executive Lounge, these suites are ideal to fully relax and unwind during your stay. Including a separate living room that's opulently furnished, and decorated with warm Moroccan tones. Individually themed with nine different styles inspired by the countries visited by Ibn Battuta, these decadent suites boast a sun terrace furnished with loungers. In addition to the separate living area, there's a large bathroom with separate tub, and full Executive Lounge privileges. 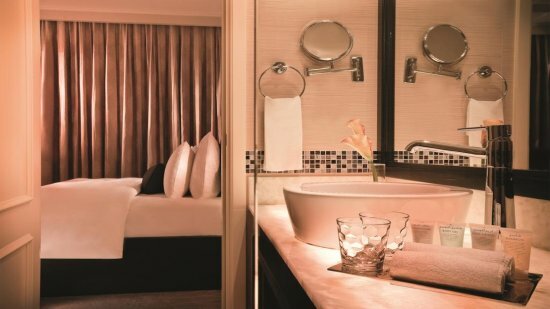 Completely opulent and delivering the finest Movenpick experience, the Royal Suite is spacious and filled with a delightful collection of ornate art from around the world. Featuring 2 bedrooms each with king-size bed, a spacious lounge and two dining areas, plus a fabulous terrace with views of the city skyline. 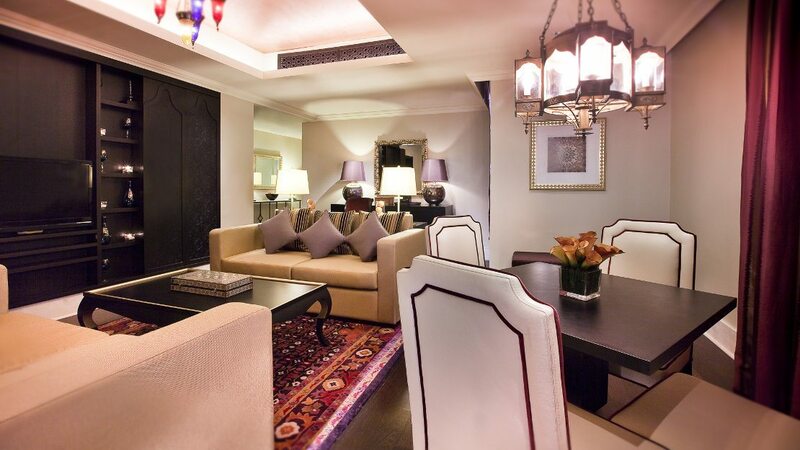 This suite is perfect for larger groups and those wishing to enjoy the best whilst holidaying in magical Dubai. Guests staying in either a Suite or an Executive Room can enjoy access to Movenpick Ibn Battuta Hotel’s private venue, the Executive Lounge. A tranquil, sophisticated environment, located on the 9th floor; it’s an ideal place to spend time relaxing during your stay. Enjoy classic Italian cuisine with a home-style approach combining the best of Sicilian cooking with Mamma's traditional touch. Seasonal ingredients and a fantastic family atmosphere, just as you'd expect. Asian traditions combine to deliver a mass of superb Asian favourites. Unlimited tasting nights allow guests to sample a little of their favourites or try something new. Relax in ornate surroundings that are warm and inviting yet contemporary and elegant. Guests can be swept up in atmospheric pleasure watching the antics and creations of top-class chefs at live cooking stations. By day enjoy the influences from Arabia and North Africa and by night, an extravaganza of fabulous seafood. Other popular menu choices are also served for breakfast, lunch and dinner. The heady scents of spices and Tandoori cuisine is the theme here. Indian cuisine showcased in fine surroundings. Beautifully decorated and translated as 'The Grand Hall' this majestic venue is a sight to behold. Fitting its purpose as a special events venue, 88 lanterns are suspended from the 90-metre high ceiling. Ornately decorated pillars and much more help set the scene for many events including the Friday family brunch. Bars at Movenpick Ibn Battuta Gate Hotel include the Olive Tree, Moroc Lounge and Bar, Majlis and Executive Lounge. See above for details of the all-inclusive programme.